Published: April 4th, 2019 by Simon. Filed in Handy Hints and tagged freestanding baths. With the pressures of daily life increasing every day, more and more Aussies are finding ways to de-stress and relax in their homes by converting their bathrooms into a relaxing, spa-like retreat. Modern technologies such as towel warmers, radiant heat floors, multi-function shower heads and steam showers can make a difference in turning a simple bathroom into a soothing sanctuary. But, if there’s one thing that is central to most of Perth’s spa-inspired bathrooms, it is a luxurious free-standing bath. Over the past few years, free-standing baths have steadily replaced spa baths and even standard baths to some degree. Today, free-standing baths in Perth are available in a range of material finishes, designs, and styles, ranging from timeless to modern, to complement any design style. If you are looking to convert your bathroom into a relaxing spa-like retreat, no doubt you have given thought to including a free-standing bath. However, you may also be wondering if they are worth the investment. After all, they are more expensive than any other type of bath or shower space. To help you decide whether or not to go with a free-standing bath, I thought it would be a good idea to outline their pros and cons. Without any doubt, free-standing baths are the epitome of designing any luxury bathroom. As far as aesthetics go, nothing comes close to the visual impact that they create. They will certainly add the ‘wow-factor’ to your bathroom, and they also allow you to get more creative with your tiles. 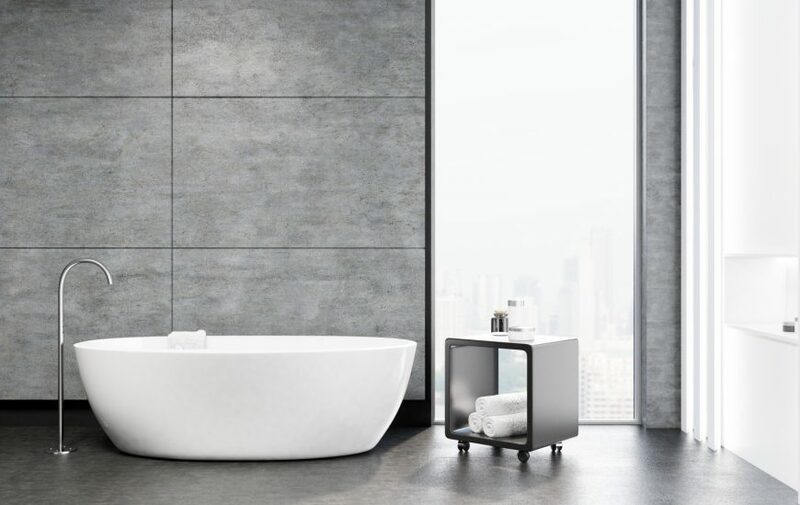 Whether you want to match your floor and wall tiles to create a uniform and seamless looking space, or whether you want to create a feature wall as the backdrop, either option will look all the more impressive when assisted by a free-standing bath. Many people think that free-standing baths serve aesthetic purposes more than practical ones. However, this isn’t entirely true. It is also incredibly easy to install a freestanding bath in any bathroom. This is because they do not require any additional framework or support, nor do they require additional tiling or grouting. You can place a free-standing bath and a free-standing mixer tap anywhere in your bathroom, and you’re done – that’s how easy the installation will be for you. You will certainly save on installation costs and time by choosing a freestanding bath. Free-standing baths are also incredibly easy to clean and maintain. Because they are not framed and tiled into a wall like standard baths, you avoid having to clean and maintain the surrounding elements such as glass, tiles and grout. You’ll discover that it is very easy to keep free-standing baths looking sparkling clean at all times! Another big advantage of free-standing baths is that they are also very easy to replace. Because there is no dismantling or reframing when replacing a freestanding bath, you won’t have to make any structural changes to your bathroom. So, in case you ever need to update your freestanding bath or replace it, you’ll find it to be a very simple affair. While free-standing baths certainly offer a range of benefits, like all things, they do suffer from some disadvantages. First of all, most free-standing baths are designed for larger sized bathrooms. If you’re looking for free-standing baths in Perth for a mid-sized bathroom, you’ll find that your options are much more limited. Nevertheless, at Ross’s Discount Home Centre, we do offer some mid-sized free-standing baths in Perth that may work out for your bathroom. Like I mentioned earlier, the cost of free-standing baths in Perth is another reason why some homeowners decide against them. They can easily cost thousands of dollars. Installing any other type of bath is significantly cheaper. So, if budget is a constraint for you, then you may not want to go with a free-standing bath. With a freestanding bath, you won’t have any space around them to store your soap, shampoo bottles and other toiletries. Unless you install a shelf close to your bath, accessing your toiletries can be inconvenient with a free-standing bath. This is however easily fixed by purchasing an affordable bath caddy, which is just $15 at Kmart. Also, free-standing baths are incredibly heavy and cannot be moved once installed (obviously). So, you have to be sure as to where you’re placing it because once installed, there’s no way you’ll be able to move it without professional help. Because of their weight, you may also need to reinforce the floor underneath to ensure that it sustains the added weight of the bath. If you think that the benefits of free-standing baths outweigh their disadvantages, then you can go ahead and include one in your bathroom. To purchase high-quality freestanding baths in Perth, look no further than us at Ross’s Discount Home Centre. We offer a range of gorgeous free-standing baths for you to choose from. On the other hand, if you think that the disadvantages of free-standing baths outweigh the benefits, then you should choose an insert bath instead. Here, at Ross’s Discount Home Centre, we have in stock a massive selection of insert baths in Perth. Regardless of whether you choose a free-standing bath or an insert bath, we have a quality bath that will meet your needs. Our prices are also the most competitive in the market. By purchasing a bath from us, you can count that you’re getting the best value for your money. If there’s one way to transform any bathroom into a luxurious and relaxing spa-like retreat, it is by including a free-standing bath. Free-standing baths in Perth come in a range of designs and shapes. Regardless of the style, you’re looking to create; you can find one to complement your space. Free-standing baths offer a range of benefits. First of all, they look gorgeous, and they will easily add the ‘wow-factor’ to any bathroom. You can also get creative with your tiles and make a style statement in your space by choosing a free-standing bath. Free-standing baths are also very easy to install – you need to decide where to have it placed. Moreover, they require very little maintenance, and it is very easy to keep them clean. Lastly, they are incredibly easy to replace. However, on the flip side, free-standing baths also suffer from certain disadvantages. Most are designed for larger spaces and finding one for a mid-sized bathroom can be difficult. They also cost significantly more than insert baths or any other type of bath. They don’t provide anywhere to store soap, shampoo and other toiletries. And lastly, they are very heavy and the floor below them may require additional reinforcement to support their weight. If you think that the benefits offered by free-standing baths outweigh their disadvantages, then go ahead and check out our range of free-standing baths in Perth at Ross’s Discount Home Centre. Alternatively, you can also consider our range of insert baths in Perth, which are significantly cheaper, i.e. $200 as opposed to $1000+. You can shop for baths in Perth at our online store, and in doing so, you’ll receive free delivery to any Perth Metro address. Aluminium sliding doors: The pros & cons you need to know!